Product Consists : Silver Sling Bag, Silver Western Neck Piece, Armaf Enchanted Intense Deodorant Spray (Weight : 200 ml) along with Mothers Day Greeting Card. Make special efforts for your mother by gifting this and wish her Happy Mothers Day. Enjoy the mother day with special gift like Silver Gifting Combo for Momma full of joy and caring, for sure your mom will say thanks to you for creating such a beautiful moments for her. Gifts can be gifted for plentiful reasons meanings and special thing is with one mouse click you can order. Whenever you get this kind of gift hamper its like you are in heaven with all the happiness of the world. This gift combo should be the best bet for Mothers Day, Birthday and Many more. 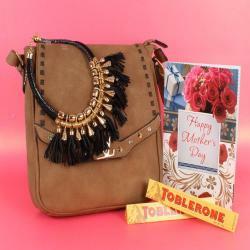 Giftacrossindia.com brings to you this awesome gift items, which is all set to make your mom to feel more special. Browse your favorite products, it is very conveniently available for online shopping from anywhere in India with Free Shipping. Product Consists : Silver Sling Bag, Silver Western Neck Piece, Armaf Enchanted Intense Deodorant Spray (Weight : 200 ml) along with Mothers Day Greeting Card.